Keep your mobile devices fully powered while ensuring that your data is secured with this charger and storage backup device. You can save time by performing both functions at once, using the Lightning connection for iPhone and iPad devices. 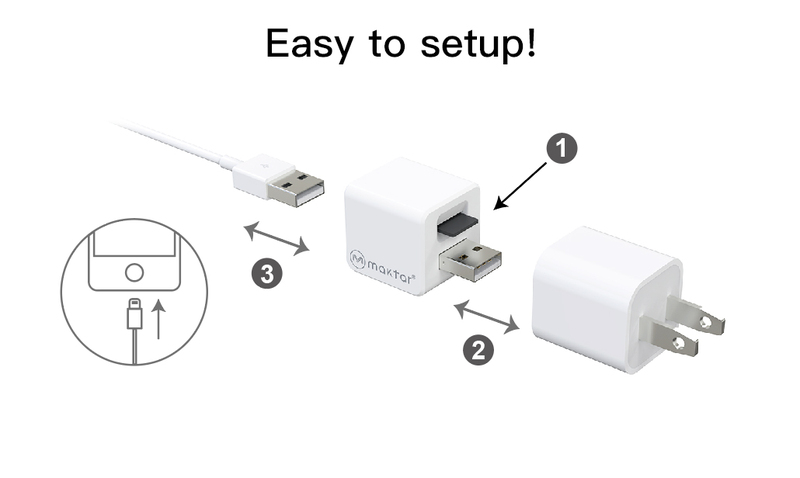 Compatible with iPhone and iPad devices with Lightning connections. Charge and back up your mobile device's storage simultaneously, providing peace of mind and convenience. Plugs in the standard USB power adapter for your iPhone or iPad (power adapter sold separately). Note: The MicroSD Memory Card is not included with the purchase of the Qubii. 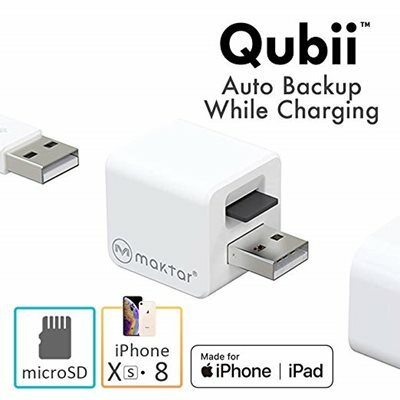 This new innovation, Qubii (pronounced cube-ee), extends Maktar’s Apple MFi certified and industry-leading position for iOS device accessories. Designed to ‘plug and play’ into the readily available Apple 5W USB Power Adapter (or any other USB charging adapter) as its pass-through external power source, Qubii allows anyone with an MFi certified Apple Lightning-to-USB cable to easily carry, use and forget about it. Qubii is designed to ‘plug and play’ into the readily available Apple 5W USB Power Adapter (or any other USB charging adapter) as its pass-through external power source. Qubii allows anyone with a MFi certified Apple Lightning-to-USB cable to easily carry, use and forget about it. Qubii performs the dual roles of auto backup while also SIMULTANEOUSLY charging the device. Qubii safeguards life’s memorable experiences such as the iPhone’s photos, videos, social media and contact information. In June, Qubii was awarded the “Best Choice” award at Computex 2018, the world’s leading ICT trade show. The Innovex section of the show recognized Qubii as being a “new and innovative electronic accessory globally." Qubii’s true innovations are not only size and functionality, but because its magic happens in the background - with patented non-interference technology - without interruption of the iPhone’s normal operation. It is all managed by our free and robust Qubii App. Once card capacity is filled, Qubii automatically reminds you to replace memory card.